Great Skin Care products to compliment your laser treatments! No appointment is necessary for Obagi purchases (please call prior to arrival to ensure a skin care consultant is available). Over the years, your skin has been exposed to a number of environmental stressors, which cause damage that can reach the deepest layers of your skin. Photodamage, caused by the sun’s harmful rays, is the main cause of the fine lines, wrinkles and age spots that you may already see or will eventually see on your face. The #1 prescription-strength, physician-dispensed skin care system provides you with benefits you see and feel. Penetrate to the root of acne to clear skin fast. 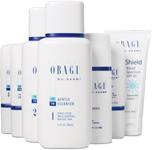 Obagi CLENZIderm M.D.™ Systems are the only prescription-strength acne treatments that contain a patented, solubilized form of 5% benzoyl peroxide (BPO) to penetrate deep into the follicle and treat acne where it starts. 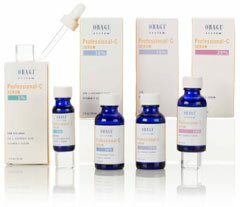 Introducing Obagi Professional-C Serums™ – new formulations in Vitamin C to neutralize free radicals at all layers of the skin, before they damage skin cells and accelerate aging. A one of a kind therapy that works to restore the skin on the chest and neck. These days your skin is aging a lot more quickly. The sun and environmental elements can take their toll, leaving behind hyperpigmentation (discoloration), age spots, freckles, fine lines and wrinkles. And although you may have diligently maintained the skin on your face for years, you may not have paid as much attention to the skin on your chest and neck, also known as your décolletage. You found it! The eye treatment that works to reduce the appearance of visible fine lines and wrinkles around your eyes. We know you’ve been frustrated. You’re not alone. But now that ELASTIderm® has arrived, your frustration ends here. And this is the one-of-a-kind product that can not only change the way you think about eye treatments, it can change the way you look. 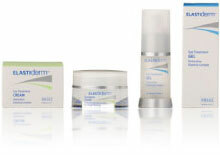 ELASTIderm® is a one of a kind eye treatment from Obagi Medical Products. By using a revolutionary bi-mineral complex called Copper Zinc Malonate, it works to help restore the elasticity around your eyes and reduce the appearance of visible fine lines and wrinkles. As the #1 prescription-strength, physician-dispensed skin care system, the Condition & Enhance® System utilizes Penetrating Therapeutics™ and is only available through your skin care professional such as a dermatologist or plastic surgeon. Unlike over-the-counter retail products, this system is clinically proven to address age spots, fine lines and wrinkles, hyperpigmentation (discoloration), erythema (redness) and future skin damage, while transforming the quality of your skin on a daily basis. The environment, the sun and the normal aging process all contribute to the fine lines, wrinkles and other facial concerns we work so hard to correct. While facial treatments and procedures such as BOTOX® Cosmetic and fillers focus on specific areas of improvement, the Condition & Enhance® System is the only prescription-strength skin care system that’s proven to collaborate with these procedures to make your overall results even better.